New users can't post images. 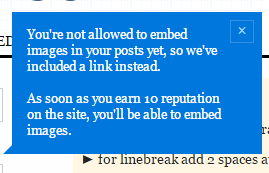 On websites like StackOverflow this isn't really necessary, and thus a good way to prevent new users from spamming unwanted images. However, on EE.SE, we often need a schematic, a pinout diagram, an image of a pcb or circuit. Isn't it a good idea to remove the 10 reputation restriction for images? Or perhaps a limit on the amount of images for new users? In response to this Meta Stack Overflow request we have implemented a change that will sort of allow low rep users to post images. Instead of embedding the image, the post will now have a link. Previously these users would get an error message when they attempted to post. I suggest that the system let a new user upload a image inline as the rest of us do, except that the image is not actually inserted into the post immediately. Instead, the post goes onto the edit review queue. Reviewers can view the image and approve or reject the image content, and of course can flag as spam, leave a comment, etc, just like they already can when reviewing suggested edits. I'm not sure what should be displayed in the post in the mean time. Possibly a box saying a uploaded image is awaiting review. If it is spam, nobody has to see it, but can still read the rest of the post and won't downvote due to missing schematic or whatever. Another option is to show the URL. That gives people access to the image, but could also give spammers underserved hits. 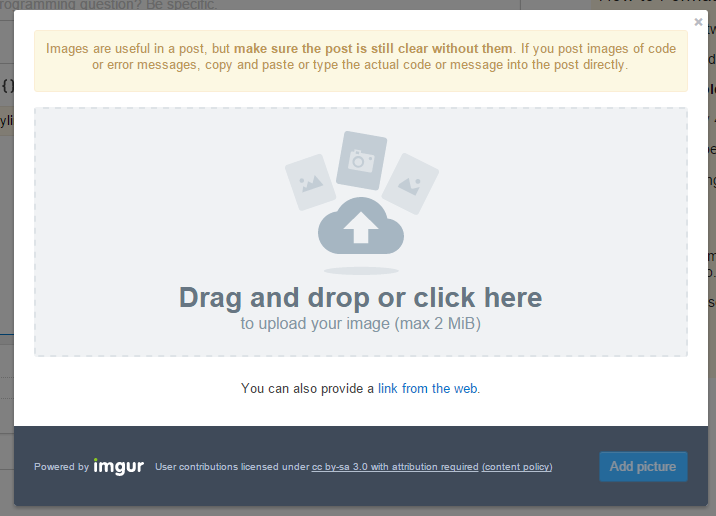 I guess that really isn't so bad if the link is pointing to a image on imgur so that it can't be a bad URL. At worst you see spam, but there would be nothing to click on, the spammer can't track the action, and it's only a image so can't exploit a security hole in your browser. I'd probably go with the second approach because the usefulness of being able to see a real image outweighs the relatively rare case of viewing a spam image, which you'd then quickly flag anyway. We can't change the image posting privilege without changing the entire "new user restrictions" privilege right now. However, the user experience we currently have that a new user would run into when trying to post an image is suboptimal. There are several ways to possibly resolve that (and Olin described one of them) and we're going to look into that. Posting images takes only 10 rep, or two upvotes on the question. New user posts should receive extra attention through the review mechanism. When I review a first post that has a URL to an image, I edit it in, and if the question was well-asked, I also upvote it. One more upvote is likely, and their next question can then include the image without help. Unfortunately, most posts don't even seem to realize that a schematic is required. Allowing new users to inline schematics won't do anything to fix that. Proposed New rules regarding new users?